It can’t be denied. Christmas is THE best time of year! From cookies and gifts to snow and hot chocolate, there is much to enjoy every year the holiday comes around! Christmas is also the time that families gather together and there’s nothing better than settling down in your home theater to replay some of your holiday favorites. Stuck on which movie to watch? Strap in and sit back - we have created the perfect list of holiday films for the entire family to enjoy! There’s nothing better than a movie you can watch repeated each year and still find yourself smiling at the end (like you didn’t know how it was going to end). In this family comedy, a grown man who was raised as an elf in the North Pole travels to New York in the search of his biological father. This Christmas, he will teach everyone around him the power of friendship, love, and holiday cheer. Gather your loved ones in front of the television, find it on Amazon video, and get ready for a feel-good flick you’ll want to watch again next year. Not everyone likes the happy, Hallmark vibes that so many Christmas films offer, so why not switch it up this holiday season and watch a movie that’s out-of-the-ordinary, but still a lot of fun? In this film, the king of Halloween Town gets bored of his traditions, discovers Christmas, and tries to take it over. It’s a movie you can watch both in October and December, and it will give you the same joy in both instances. If you’re a fan of Tim Burton or his style, then why not check it out on Netflix this Christmas? Do you or the kids ever wonder how someone could become Santa Claus? Discover many Christmas secrets in this movie where a man accidentally knocks Santa off his roof on Christmas Eve and has to take his place. It’s a sweet family flick that doesn’t cross the line into overly goofy like the sequels do, so it’s just perfect for parents who want to snuggle in close on a Seatcraft Genesis Theater Sofa with the kiddos and just relax. Check it out on Netflix before Santa comes and goes! Release your inner child and be prepared to laugh out loud with your kids while watching Home Alone! In this film, a young boy is forgotten at home when his family goes on Christmas vacation and has to fight off burglars who have targeted his house. It is absurd, pretty unbelievable, but still charming enough for us to tune in every year. You can find this gem on HBO Go! Nothing whacky or outrageous here-- just a boy who desires a toy. This film takes a classic approach to the concept of Christmas, and follows a boy in the 1940’s who wants nothing more than a BB gun for Christmas. To take things to another level, he also tries to convince everyone around him that he deserves it. If you’re the type who just wants to take the holiday back to the good ‘ole days, then this deserves a watch. Stream it on Amazon Video and have a fun, relaxing experience! It’s the remake of a classic Dr. Seuss tale that everyone seems to love! Watch as a green grinch sets out on a mission to ruin Christmas for everyone in Whoville. Even though it doesn’t have Thurl Ravenscroft’s amazing vocals throughout, the movie still maintains the spirit of the original and steps it up a notch for the younger generation to enjoy. You can find this film on Netflix now! When you think of Christmas, one of the first images that pops in your head is a certain young reindeer with a red nose. It’s a classic image that is here to stay! In this TV movie, a misfit reindeer strives to find a place that he and his friends can belong. The animation isn’t as clean as it is today, but it’s the stop-motion that makes us continue to love it even after all these years. You can view this movie on Amazon Video. Even adults deserve a Christmas movie they can watch after the kids have gone to bed. In this not-so-family film, a conman and his partner pose as Santa and an elf in order to rob department stores on Christmas Eve. If you’re the type of person who isn’t a fan of the constant Christmas cheer, then watch the holiday fall apart in a hilarious way! You can stream this movie on HBO Go and Hulu. Are you not a fan of the crazy commercialism that is attached to the holiday? Neither does this movie, so it’s something you can connect with! In this film, a father travels all over town and fights the crowds to find a promised, sold-out action figure for his son. Even though it was considered a disappointment when it came out, it is the harsh reality of the holiday season and overall spirit that makes it on our must-watch lists. Watch it on Amazon Video today! Not everyone likes all that travelling during the holidays to visit family they don’t necessarily get along with. If that describes you, then choose the movie that perfectly embodies the dysfunctional family drama that everyone encounters. A couple is forced to visit all four of their divorced parents on Christmas day. Every awkward encounter that you can think of happens, but it still holds the charm that only a Christmas movie could have. It can be streamed on Amazon Video today. If it takes place during Christmas, then it is technically a Christmas movie, right? Bring more action into your home during the holiday with a movie that follows action hero, Bruce Willis, as he tries to save his kidnapped wife from a terrorist during a Christmas party. It’s a movie perfect for date nights any time of the year, but make it special this Christmas by snuggling up with your partner in a Seatcraft Swivel Cuddle Couch. Take in all the action by streaming it through Amazon Video! You can’t go wrong with a true holiday classic! In this black and white film, a young lawyer decides to defend a nice, old man who was institutionalized for claiming to be Santa Claus. The purity of this film is something that many newer Christmas movies just don’t have, so if you want to be transported to simpler times, this is the movie to watch. You can stream it on Amazon Video this holiday season. This movie is considered the number one Christmas movie of all time, so if you haven’t seen it yet, you’re missing out! In this film, an angel is sent to show a frustrated businessman what life would be like if he never existed. This is something to watch if you want to give yourself a new appreciation for all the ups and downs that come with life, so stream it on Amazon Video this season and soak in all the good feelings. If you’re the type who doesn’t like to go through the trouble of fulfilling Christmas obligations and celebrations, then skip it with the Kranks! This movie is about a family who decides to go on a cruise instead of celebrate Christmas, but then scramble to put the holiday back together when their daughter decides to come home. It highlights the craziness of the holiday, but also the importance of coming together with friends and family. You can stream it now on Amazon Video and Hulu. Ever had your holiday plans fall apart miserably? Yeah? Well then you’ll relate to the characters of the National Lampoon movies. In this one, the Griswold family’s plans for Christmas fall apart in disastrous ways. It’s a comedy of errors that comes together into a holiday classic. You can stream it today on Amazon Video. Even though it’s not a long movie, it is still a Christmas special that so many people grew up with, and needs to reach the next generation. Charlie Brown tries to find the true meaning of Christmas outside of all the commercialism around him. Charlie Brown is a character that all kids love and has graced our screens for each holiday, so it is a must to include him during Christmas festivities. You can stream it now on ABC Go. The iconic tale of Scrooge comes to life again in a comedic form! In this version, a selfish and cynical TV executive is haunted by the three ghosts of Christmas and learns their valuable lessons. It’s the type of movie that teaches us to be the best person we can be, and will always put us into the holiday mood. It can be streamed on Netflix now. Beautiful and genuinely brilliant movies don’t always have to be ones made long ago. In this film, children everywhere can follow a young boy as he embarks on an adventure to the North Pole, where he learns about friendship, bravery, and the spirit of Christmas. This film definitely does the original book justice in this adaptation, and the amazing visuals bring us Christmas cheer in many different ways. It can be streamed today on Amazon Video. Just like with Die Hard, not all Christmas movies have to follow the traditional holiday formula. In this, a boy receives a unique pet as a Christmas gift, but breaks the important rules that come with it and unleashes monsters into his town.This movie mixes comedy with horror to bring us an experience as unique as a gremlin itself, and that knowledge is what caused it to become beloved. It can be streamed on Amazon Video this holiday season. We can’t end a Christmas list without including some Bing Crosby into the mix! In this film, two song-and-dance teams come together to save a failing inn that belongs to their former commanding general. It is a musical that can put even the biggest scrooge in the holiday spirit, and we can’t help but fall in love with Bing Crosby’s voice. This film can be streamed on Netflix today! 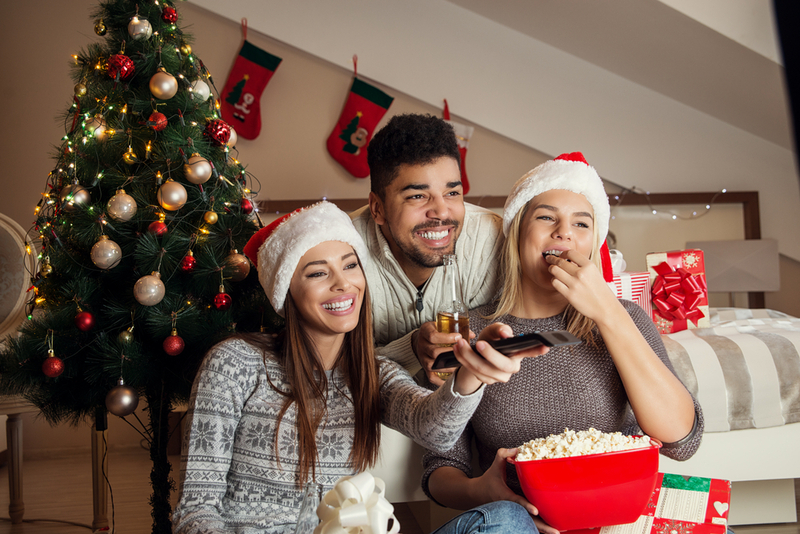 Christmas wouldn’t be complete without these amazing holiday movies, along with the comfort and style that only Seatcraft can bring to your home theater! Bring the family together this holiday season for the perfect Christmas you’ll want to become a tradition!